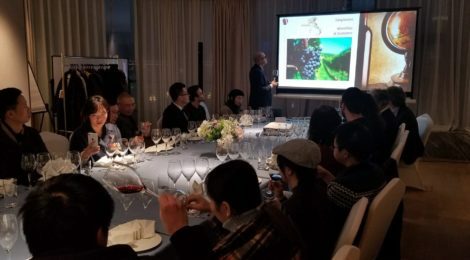 In December 2018, the Galileo Galilei Italian Institute (GGII) together with the Consulate General of Italy in Chongqing organized three seminars about the Italian Culture of Wine and Wine Tasting events respectively in Chengdu, Beijing and Chongqing. The seminars, part of a round of activities planned for the visit in China of a delegation of professors coming from Sant’Anna School of Advanced Studies (SSSA), besides introducing the high quality of Italian wine, presented a feasibility study for an advanced training course to be held between China and Italy organized by SSSA in collaboration with GGII and Chongqing University. The Course will deal with the Italian wine, in line with the one already existing “Italian Wines and World Markets” by SSSA in Italy. How important is wine for a country like Italy? A lot, since Italy is the first wine-producing country in the world, with over 48,500 million/hl per year. The export of Italian wine around the world is also increasing, with an average of 6% yearly. Germany, United States and United Kingdom’s represent, with an import of over 10.000 million/hl yearly, the most enthusiastic countries about Italian wine. Far away from this number, the export of Italian wine to China is very little. Given the size of Chinese population, only 1,5 litres per person per year is consumed in the second world economy (Italy 43,6 – France 52,2 – USA 12,1). A a matter of fact, China represents just the 14th biggest purchaser of Italian wine, with a rapid annual increase. The great success of the Italian wine around the globe is also connected to the extraordinary grapes’ varieties, over 517 available in Italy, 407 PDO (Protected Designation of Origin) of which 74 DOCG and 333 DOC. During the activities, Pietro Tonutti, professor of the Institute of Life Sciences of SSSA and Director of the Master, illustrated the characteristics and peculiarities of four Italian wines: two from Sangiovese (Morellino and Chianti Classico) and two from Corvina and Corvinone (Valpolicella and Amarone). The wines mentioned are produced with different kind of grapes and are both from Tuscany. The second part of the seminars was managed by Dr Alfonso De Pietro, Project Manager of The Italian Way of Wine (IWW). According to Mr De Pietro, selling wine in China is not easy since the main limit for foreign companies is that locals usually has no knowledge about wine. That’s why a good starting point should be education and cultural formation about wine. IWW with Sant’Anna School, GGII and their partners intend to develop an Advanced Training Course aimed to transmit the “Italian Culture of Wine” to China and to consolidate it, as well as to create new “Ambassadors” of Italian oenological assets and new opportunities for winemakers to find a place within Chinese emerging market. The chosen pathway aims at proposing a training model characterized by marked originality through diverse and varied didactic approaches, options and methodologies. At the end of the Course, there will be an experiential tour of Italy and the participants will be awarded with the title “IWW Expert Certificate” issued by SSSA.